On Twitter last year, Monsanto VP Robb Fraley asked why people doubted science. He linked to an article in National Geographic that implied people who are suspicious of, among other things, genetically modified organisms (GMOs) are confused, adhere to conspiracy theories or are misinformed as a result of access to the "university of Google." It is worth mentioning that science is not the giver of absolute truth. Science historian Thomas Kuhn wrote about the revolutionary paradigm shifts in scientific thought. Philosopher Paul Feyerabend argued that science is not an exact science, and the manufacture of scientific knowledge involves a process driven by various sociological, methodological and epistemological conflicts and compromises, both inside the laboratory and beyond. But the answer to the question "Why do people doubt science?" is not because they have read Kuhn, Feyerabend or some sociology journal. Neither is it because a bunch of irrational activists have scared them witless about GM crops. It is because they can see how science is used, corrupted and manipulated by powerful corporations to serve their own ends. U.S. sociologist Robert Merton highlighted the underlying norms of science as involving research that is not warped by vested interests, adheres to the common ownership of scientific discoveries (intellectual property) to promote collective collaboration and subjects findings to organised, rigorous critical scrutiny within the scientific community. Secrecy, dogma and vested interest have no place. But if we really want to look at the role of secrecy, dogma and vested interest in full flow, we could take a look at in the sector to which Fraley belongs. The GMO agritech sector is only concerned with a certain type of science: that which supports its aims. In 2014, U.S. Agriculture Secretary Tom Vilsack called for "sound science" to underpin food trade between the U.S. and the E.U. Consumer rights groups in the U.S. are pushing for the labeling of GMO foods, but Vilsack said that putting a label on a foodstuff containing a GM product "risks sending a wrong impression that this was a safety issue." Despite what Vilsack would have us believe, many scientific studies show that GMOs are indeed a big safety issue. But Vislack tries to prevent proper debate about issues that his corporate backers would find unpalatable. And "corporate backers" must not be taken as a throwaway term here. Big agritech concerns have captured or at the very least seriously compromised key policy and regulatory bodies in the U.S., Europe, India and in fact on a global level. GM is so heavily pushed because it offers a lucrative way to control intellectual property and global supply chains. It's highly convenient for Vilsack to want to close down debate on the GM issue. Coming from the GMO biotech industry, or its political mouthpieces, the term "sound science" rings extremely hollow. The industry carries out inadequate, short-term studies and conceals the data produced by its research under the guise of commercial confidentiality while independent research highlights the dangers of its products (many peer-reviewed studies are cited in the last link). It has in the past also relied on fakery in India, bribery in Indonesia and smears and intimidation against those who challenge its interests, as well as the distortion and the censorship of science (see this and this about the "Seralini affair" as well). The GMO agritech sector is only concerned with a certain type of science: that which supports its aims. Because if science is held in such high regard by these corporations, why isn't Monsanto proud of its products? Why in the U.S. doesn't it label foods containing GMOs and throw open its science to public scrutiny, instead of veiling it with secrecy, restricting independent research on its products or resorting to unsavoury tactics? 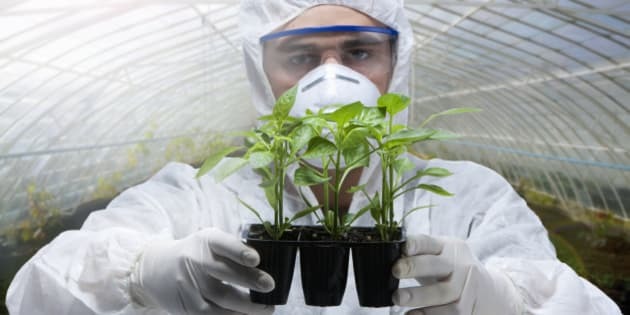 If science is held in such high regard by the GMO agritech sector, why in the U.S. did policy makers release GM food onto the commercial market without proper independent long-term tests? Where is the data to prove safety? It attempted to get around this by using the throwaway term "substantially equivalent," which has nothing to do with science. Foreign genes are being inserted into organisms that make them substantially non-equivalent. Substantial equivalence is a trade strategy on behalf of the GM sector that neatly serves to remove every genetic modification to our food from proper scrutiny. The reason why no labeling or testing has taken place in the U.S. is not due to "sound science" having been applied, but comes down to the power and political influence of the GMO biotech sector and because a sound scientific approach has been substituted for fraud and mass deception. It is not science itself that people have doubts about, but science that is pressed into the service of immensely powerful private corporations. The sector cannot win the scientific debate so it resorts to co-opting key public bodies or individuals to propagate various falsehoods and deceptions. Part of the deception is based on emotional blackmail: the world needs GMOs to feed the hungry, both now and in the future. This myth has of course been taken apart many times before (for example, here). People's faith in science is being shaken on many levels, not least because big corporations have secured access to policy makers and governments, and are increasingly funding research and setting research agendas. Ultimately, it is not science itself that people have doubts about, but science that is pressed into the service of immensely powerful private corporations and regulatory bodies that are effectively co-opted and adopt a "don't look, don't find approach" to studies and products. Or in the case of releasing GMOs onto the commercial market in the U.S., bypassing proper scientific procedures and engaging in doublespeak about "substantial equivalence" then hypocritically calling for "sound science" to inform debates. Finally, if Robb Fraley wants to know why people doubt his company -- and indeed the science that it supports -- its track record of duplicity and criminality is clear for all to see. That alone provides very good reason why so many would doubt and challenge powerful corporations and the type of science they fund and promote. Perhaps the question we should be asking is: Mr Fraley, why isn't Monsanto on the side of science?